Sanakht was probably an elder brother of Djoser and reigned just before him. The only (?) two found depictions of him is on a fragment from a sandstone relief from Sinai and a crude rock carving in the same area, close to the copper mines. (See link from his main text below). He has no known tomb in Sakkara but a large mastaba in Beit Khallaf near Abydos had remnants with his name and skeleton remains possibly from the king himself. No sculptured portrait of him has survived. Nor do we know of any names for sure of officials working for his adminisration. The mastaba tomb in Beith Khallaf contained a title (Overseer of the granaries) and the names of two possible public servants. The Table of Swelim gives him a reign of 17 years, the Turin Canon notes 19 and Manetho claims 28. 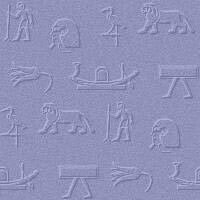 Most Egyptologists today go for the lower figures.